Record your screen. Edit your video. Share with the world. 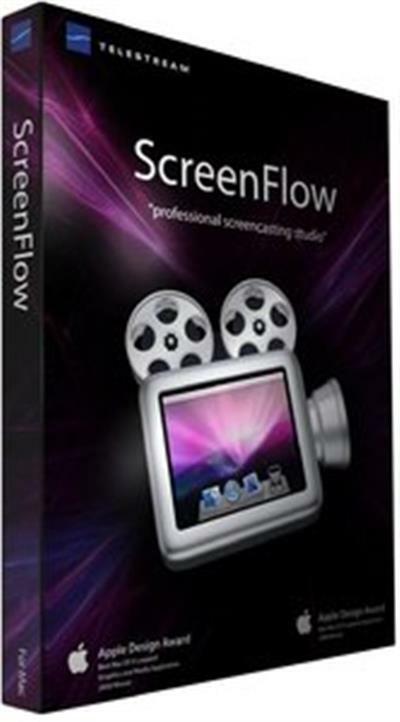 Telestream ScreenFlow is an award-winning, powerful screencasting and video editing software for Mac that enables high-quality software or iPhone demos, professional video tutorials, in-depth video training, and dynamic presentations. With ScreenFlow you can record the contents of your entire monitor while also capturing your video camera, iOS device, microphone and your computer audio. The easy-to-use editing interface, updated with a fresh new look for Yosemite, lets you creatively edit your video, and add additional images, text, music and transitions for a professional-looking screencast. The result is an MP4 or QuickTime movie, ready for publishing to the Web or directly to YouTube, Vimeo, Wistia, Facebook, Google Drive or Dropbox. Retina display? No problem. Our efficient algorithm enables full-screen, 2880 x 1800-resolution screen capture with brilliant detail, while keeping file sizes low. Easily add images, text, audio, video transitions and more to create professional-looking videos. Nested clips, closed captioning, chroma key, mouse callouts, annotations, rolling edits, video and audio filters, video actions such as iOS Touch callouts and freehand callouts are just a few of the touches that make ScreenFlow editing easy and powerful. Every so often design and function combine to form an elegant piece of software that's easy and fun to use. ScreenFlow makes editing video easy, so users can focus on creatively telling their story. ScreenFlow uses the popular x264 codec for significantly faster and higher quality H.264 exports. ScreenFlow runs as a fully 64-bit application, which improves overall performance, memory usage, export speed, and scalability. Expanded publishing options let you easily publish your video to YouTube, Vimeo, Wistia, Google Drive, Dropbox or Facebook in just a few clicks.